Nóra, bereft after the sudden death of her beloved husband, finds herself alone and caring for her young grandson Micheál. Micheál cannot speak and cannot walk and Nóra is desperate to know what is wrong with him. Whispers are spreading: the stories of unexplained misfortunes, of illnesses, and the rumours that Micheál is a changeling child who is bringing bad luck to the valley. Nora, along with her maid Kate and the healer Nance, try and use their world of folklore and belief to heal Micheál. I loved Kent’s first novel Burial Rites and will probably always remember it as the first book I read after my son was born, when I was finally able to concentrate on more than a single page! 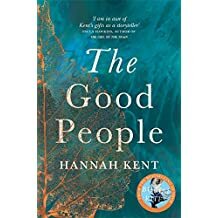 I downloaded The Good People in December 2016 on a trip to Australia but only just got around to reading it. I think I had a fear that I wouldn’t enjoy it if the supernatural element was too strong as I hate stories with fairies and magic realism. Much to my relief, Kent doesn’t go down this path. What she has created is a brilliant setting – an isolated community who live and breathe superstition without it being extraordinary in any way. It is a bleak novel to match the landscape. This is similar to Burial Rites (I am sure Kent must tire of people comparing the two) but it just feels so much bleaker. Perhaps this is because it is a hard life for all the characters as they all live in rural poverty. It feels as if there’s no glimmer of a pleasant life for anyone in the whole of County Kerry. Due to this pervading bleakness I did sometimes miss when the character changed and had to go back to the start of the paragraph but this may also be due to the Kindle formatting. I was really curious about the court case at the end and would have loved to see the case through the eyes of the lawyers and townspeople but I know it was not their story. I will have to use my imagination to decide how they felt about these traditional beliefs and healing methods! I was also curious to know what Micheál’s affliction was but I have since read online that Kent was purposely vague about this so people couldn’t identify his illness. Overall, I really enjoyed this novel. It was bleak but not depressing – there is a difference! I didn’t necessarily feel an affinity with any of the three main characters but I didn’t need to as it was the story and setting that were paramount to enjoying this novel. I’m surprised it hasn’t been short or long listed for more prizes. Bleaker than Burial Rites? I’m going to have to wait until I’m in the mood for The Good People as am still getting over Burial Rites.